5 Ways You Might Epigenetically Boost Your Child’s Health Before Birth | What is Epigenetics? When the Twin Towers came down in 2001, it was one of the most shocking moments in human history. This brazen act of terror traumatized an entire population. For those who lost friends, family, and acquaintances in the tragedy, it was an enormous cause of stress, grief and general departure from a normal state of being. Among the affected, many were pregnant women – some of whom developed PTSD after the incident. As reported in The Journal of Clinical Endocrinology & Metabolism, when these women gave birth, there were certain peculiar effects observed in the children. The children who had mothers with PTSD were born with lower levels of cortisol, whi­ch is known as the stress hormone. In addition, their responses to stress-inducing stimuli in their environment were dysfunctional. Although none of these kids had witnessed the horror themselves, their biochemistry reacted as though they had. This wasn’t some random coincidence. It was a demonstration of the power of epigenetics. Epigenetics isn’t necessarily just a function of the physical and mental state of women giving birth. It is far-reaching, many studies hinting that a child can be influenced by the lifestyle and health of his or her parents and possibly even grandparents before being born. Epigenetic marks on top of DNA, which can come about due to environment and behavior, might be passed down from generation to generation. Epigenetic mechanisms like DNA methylation or histone modification refer to the adjustment in chemical tags, such as a methyl group or acetyl group, on specific areas of DNA or histones. This, in turn, changes the expression of genes and influences health and wellbeing, specifically playing a role in the development of diseases like obesity, cancer, or cardiovascular disease. Still confused? Read a simplified explanation of epigenetics. 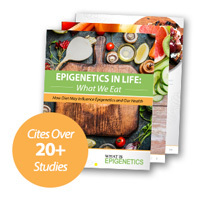 Or delve into a technical description to learn more about the fundamentals of epigenetics. Although the exact molecular underpinnings of transgenerational epigenetic inheritance have yet to be understood, epigenetics research offers fascinating insight into the possibilities and can help guide us to make better decisions for ourselves and our future children. In a recent study performed by the Department of Neuroscience at the Icahn School of Medicine at Mount Sinai, mice that were placed in cages with bigger, stronger males developed signs of post-traumatic stress disorder, anxiety, and depression. After ten days of this, they bred with females who had no such symptoms and it was found that the resulting offspring also exhibited symptoms of anxiousness and stress. Since the mothers didn’t bring any prior stresses or dysfunctions to the table, it was concluded that the symptoms displayed by the pups were a direct result of the trauma that the fathers underwent before they bred. Epigenetics isn’t limited to such immediate timeframes either. In Overkalix, a small region of Sweden, people were at the behest of the weather for much of the 20th century. They prospered and had plenty to eat when the weather was conducive to produce, and went hungry when the winters or bad weather conditions impeded the harvest. 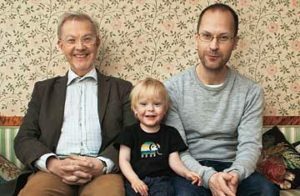 In a study in the European Journal of Human Genetics, researchers found that the grandsons of people who had suffered from starvation in the latter part of their childhoods went on to have grandsons with little to no health problems. On the other hand, the grandsons of people who had plenty to eat during a similar timeframe in their lives developed conditions such as diabetes and heart diseases and had short life spans. These results suggest that the decisions you make concerning your health and fitness in this lifetime will ripple out over the years to come, with potential to influence your kids and grandkids. Women who are pregnant influence their kids in subtle and significant ways depending upon their nutrition habits immediately preceding and during the course of their pregnancy. Now, research is showing epigenetics has a hand in the transmission of a parent’s bad and good habits to his or her child’s health. Fathers, for instance, transmit their genetic conditions through their sperm. This means that whatever conditions, ailments, health and fitness levels and other habits men bring to the table when they fertilize their partners are likely to affect not just the current fetus, but the future progeny of the fetus. For example, a father’s folate deficiency or exposure to phthalates can impact his sperm epigenome and affect his children’s health. So what lessons can we learn from the power of epigenetics? More specifically, what habits might we follow to set up our kids, and the kids of our kids, with a better chance for a healthy life? And especially if you’re looking to get pregnant, avoid obesity. In a study performed on genetically identical mice, it was found that when the mothers were exposed to a typically fattening American diet, the male offspring were born with genetic material that made them vulnerable to obesity. In contrast, the mice born to mothers who were lean and had a healthier diet were born leaner, and had a genetic makeup that made them resistant to developing obesity later in life. As published in the American Journal of Physiology, diet composition near the time of pregnancy is shown to increase risk of the offspring being overweight. Epigenetic studies have also found that being obese can impart marks on the DNA of your children which will later influence their likelihood of becoming obese. In a study published in Nature Genetics, mice were fed a high fat diet, became obese, and developed type 2 diabetes. The researchers then isolated their gametes, performed in vitro fertilization, and implanted them into healthy female mice who consumed a normal diet. Despite being carried by healthy mothers, the children – especially the females – were still born predisposed to develop severe obesity. Although it’s recommended to avoid obesity when pregnant, an expecting mother shouldn’t veer to the other extreme and deprive herself of proper nutrition. In a study performed at the Faculty of Medical and Human Sciences at the University of Manchester, it was found that women who were malnourished during their pregnancy gave birth to children who had a genetic predisposition to overeating. Alternatively, previous research in Journal of Child Psychology and Psychiatry found that a high-fat, high-sugar diet during pregnancy could be connected to ADHD in children. They found that mothers who ate sweet and fatty foods during pregnancy increased DNA methylation of the IGF2 gene in their children with early onset problems. This gene is linked to fetal development and development of certain areas of the brain associated with ADHD. Interestingly, higher DNA methylation of IGF2 at birth was able to predict ADHD symptoms in children who had early-onset conduct problems between the ages of 7 and 13. Eating too many sweet and fatty foods, this study suggests, may influence epigenetic marks and potentially predispose children to developing various diseases. While some may recommend using certain supplements to overcome the gaps in our diets, it is counterproductive to prefer supplementation over actual food. In some cases, it has even been found that the source of the dietary protein during pregnancy can cause significant differences in the offspring. Male mice born to mothers who had soy protein during pregnancy were fatter and had higher blood pressure than those born to mothers who were fed with casein. These results were published in the British Journal of Nutrition. And what about the father? A study in Molecular Psychiatry found that a child’s mental fitness could be epigenetically influenced by his dad’s diet. A team of researchers from the German Center for Neurodegenerative Diseases (DZNE) found that fathers who consumed an excessive amount of particular supplements could epigenetically harm their offspring, affecting their children’s memory and learning ability. The supplements were considered methyl donors, such as methionine, folic acid, betaine, choline, vitamin B12, and zinc. It is important to discuss supplements with your doctor and consider the positive and potentially negative effects they may have. If the mother undergoes periods of significant stress before or during the time she is pregnant, the child is likely to inherit some of the stress symptoms. And this inheritance of stress is not just limited to the mothers. As mentioned before, fathers who are put through stressful situations are likely to transmit these conditions through their sperm. This makes their children and their grandchildren more susceptible to stress-related disorders. 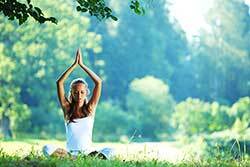 Practicing yoga is an excellent, low-intensity method to reduce stress. A study in Cell Metabolism linked stress in mice fathers to increased high blood sugar in their offspring as a result of DNA methylation. The psychological stress experienced by the fathers was actually transmitted epigenetically from their sperm to their children, setting them up for high blood sugar. In another study in Nature Neuroscience, investigators reported that mice that experienced stress early on passed down consequences such as depression, underestimation of risk, and upset of metabolism to their offspring. This was the case even if their children were not directly exposed to the trauma or stress. Various changes to microRNAs, which prevent the production of proteins and play a key role in genetic expression, impacted the pups’ stress and metabolism. Air pollution could alter epigenetic tags and increase risk for neurodegenerative disease. Pollution is all around us and, unfortunately, it is difficult to escape. Children who are born to pollution-exposed mothers were found to have an increased chance of developing asthma and other allergic diseases. Exposure to environmental pollution while pregnant, including diesel exhaust or concentrated urban air particles, could increase a child’s risk of asthma due to epigenetic mechanisms. This allergic susceptibility might even be passed down for several generations, according to the study published in the Journal of Physiology. Reducing your own exposure to pollutants could help set up your child for better health down the road. While science hasn’t isolated every single factor that affects epigenetics, we can safely conclude that being healthy is beneficial for our offspring, and being unhealthy is bad for them. We still have a long way to go in terms of understanding all biological nuances of transgenerational epigenetic inheritance, but this research poses many questions and brings to light many things we may not have even thought possible. So if you’re overweight, unfit or have medical conditions or addictions, it’s not good for your future children. We know that smoking or consuming alcohol while pregnant isn’t a good decision, while taking walks or performing light exercise is. Even if there isn’t a study performed for every single factor that affects our future children, we can apply common sense to many of these situations. While it might be intimidating to think that our life choices extend far beyond us, it is also empowering. If we make the decision to eat healthy, exercise regularly, and surround ourselves with people and environments that invigorate and appreciate us, our children are likely to reap the benefits. What do you think about the potential power of epigenetics and its link to the health of multiple generations? Share your thoughts in the comments below. Disclaimer: The points made herein represent a speculative opinion of the author based on related scholarly publications on animal studies and may not actually apply to humans.